The Lecture Room pages listed here have been carefully chosen for their interest to learners. These are not just pages of dry text, but material that has been designed to inform and educate; many of the pages allow interaction and try to challenge your understanding. The Physics Classroom: Sound Waves and Music. An introductory tutorial on the Physics of Sound designed for schoolchildren. Contains useful self-test questions. Web tutorial on Loudness by Mark Huckvale. An extensive interactive tutorial about how our sense of loudness is related to the physical form of sound and the operation of our hearing mechanism. Web tutorial on Pitch by Mark Huckvale. An extensive interactive tutorial about how our sense of pitch is related to the physical form of sound and the operation of our hearing mechanism. 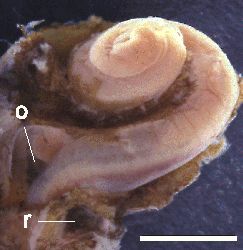 A Promenade Round the Cochlea. Take a virtual tour around the anatomy and physiology of the ear. With lots of graphics (e.g. above). Spectrogram Reading Tutorial. Spectrograms are representations of a speech signal which emphasise the aspects our ears are sensitive to. Thus somewhere in the spectrogram are the clues (or cues) which tell us what is being said. This course from the Oregon Graduate Institute is about how to 'read' spectrograms - how to see the phonetic detail in the acoustic form. MRI images of vocal tract shapes. As an alternative to X-rays, MRI scanners are safe but slow. However this site shows how 3D models can be generated from MRI data. Voice Qualities. A discussion of how different voice qualities such as Modal, Breathy, Creaky and Falsetto originate in the Larynx. Also how the ElectroGlottograph (or Laryngograph) operates to show these. Web Tutorials in Phonetics. These tutorials from University College London include: the Phonetics of voicing: how vibration in the larynx is the sound source for many speech sounds. the Phonetics of plosives: how sounds like p, t, k are made and contrasted. on-line phonetic transcription: practise your use of the phonetic alphabet. intonation transcription: practise your ability to identify different pitch contours used in speech. The Mouton Interactive Introduction to Phonetics and Phonology. An interactive teaching CD-ROM publication. Introduction to Corpus Linguistics. Corpus linguistics is the study of linguistics through the medium of geneuine collected materials, often with a statistical flavour. These pages are designed to accompany a book in corpus linguistics, but also serve as a general introduction to the field. Do you know of other interactive teaching material? Send us a message.